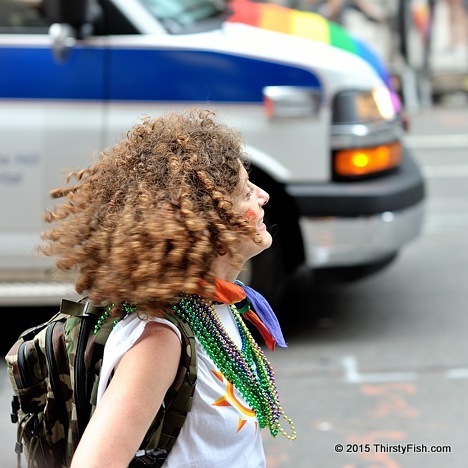 Another one from the NYC LGBT Pride Parade, 2015. We fail to understand that culture is not rational. No culture is. Not your culture, not their culture. Culture is an invention, a construct. To claim your culture is superior is a trap. The moment you do so, you jeopardize whatever good there is in your culture and initiate the process of cultural decline. Hence, history repeats itself. The blind belief in American exceptionalism is the reason for the American decline. The current political culture in Washington D.C. is best summarized by author Garet Garrett: "To outsmart the Constitution and circumvent its restraints became a popular exercise of the art of government". And when "Domestic policy becomes subordinate to foreign policy", it is a sure sign of imperial ambitions - and we all know what happens to empires who claim to be exceptional.